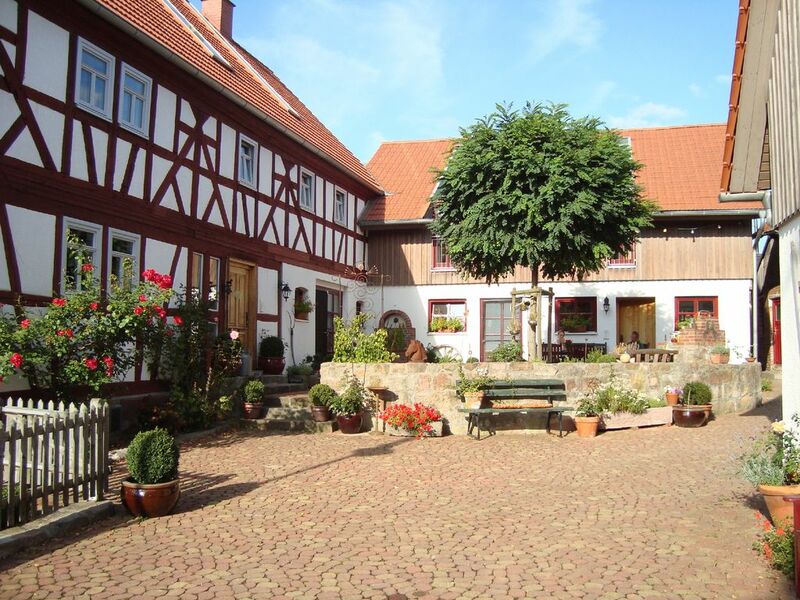 In a 850 soul village at the foot of the Rhön is our 350 year old farmhouse with a beautiful apartment for 2 to 4 people. We offer you an open apartment (loft) in the attic with approximately 65sqm floor space and large windows embedded in the roof, awarded by the DTV with 3 stars, double bed, sofa bed, sauna, bed linen, towels, bathrobes, TV, stereo, wireless internet, fully equipped Kitchen, parking space, separate garden area, outdoor seating in the barn, barbecue facilities, garaging for bicycles and motorcycles. The apartment is a Non smoking apartment. Animals are not wanted. You can also use washing machine, dryer, iron and freezer. Sehr schöne Wohnung, die ihr Geld wert ist. Nette Begrüßung, schönes Ambiente und ein selbstgebackenes Brot als Gastgeschenk. Eine der schönsten Unterkünfte die wir bisher hatten. Danke für Ihre nette Bewertung. Wir wünschen Ihnen schöne Feiertage und alles Gute für‘s neue Jahr. Wir hatten hier ein wirklich tolles Wellness Wochenende, es war für alles gesorgt. Ausreichend Handtücher da, gemütliches Ambiente, schöne Sauna, alles sauber und ordentlich. Küche super ausgestattet und die Besitzerin sehr zuvorkommend. Wir kommen jederzeit wieder! Ein guter Ort zum Erholen! Superschöne Fewo, nette Gastgeber, alles wie beschrieben, gern wieder. Es ist eine superschöne Ferienwohnung in der an nichts fehlt.sogar Handtücher waren ausreichend vorhanden und die Betten waren bezogen .sehr sehr nette Vermieter. Wir kommen gerne wieder. Only 3km away is Hesse's most beautiful baroque palace "Schloss Fasanerie" - your attractive excursion destination near Fulda with its museum, park and gastronomy. We recommend a trip to the baroque city of Fulda with guided tour of the city, a visit to the cathedral and St. Michael's Church as well as a walk through the castle garden. Brochures about further activities in Fulda are in the apartment. The Rhön, the land of open distances invites you to extensive hikes, to the Nordigwalking, hang-gliding and paragliding, mountain biking, tobogganing in summer and in winter, skiing, climbing, ballooning and much more. It is also worthwhile to make a trip to Bad Hersfeld, Bad Brückenau, Bad Orb or the nearby Vogelsberg. Treat yourself to a day at the nearby thermal baths. A trip for children to the children's academy or the Takka Tukka country is worthwhile in any case.